Dashboard is the system homepage. It provides a holistic view of the entire practice by listing current and historical statistics of several key practice performance indicators. The information is provided in a tabular and/or graphical view for quick performance analysis of the entire practice. This allows you to quickly detect any negative trend development and take immediate evasive action. Shows appointment status details including historical statistics in a tabular format. Total co-pay collected over various periods is shown as part of quick financial overview of the practice. 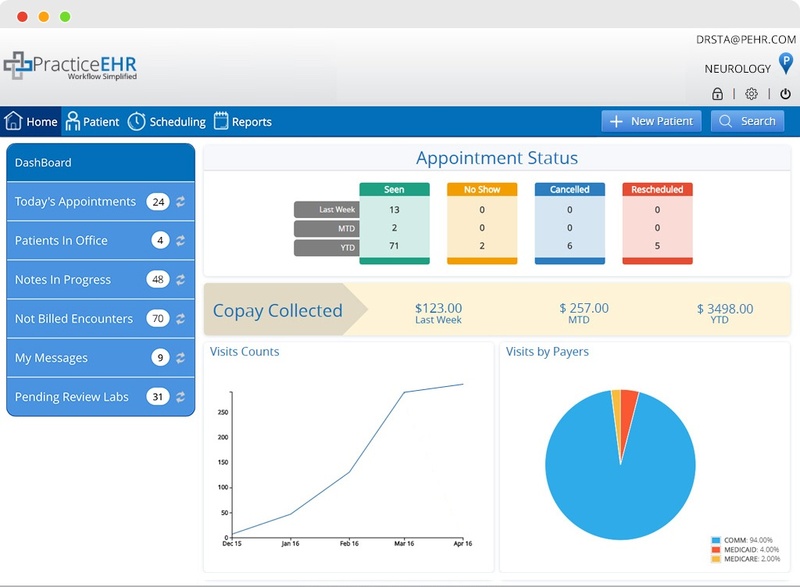 Visit counts over months are shown in a graphical view for quick monthly practice visit performance analysis. Quick access to today’s appointments, patients in office, notes in progress, and any encounters that have not been billed yet. Quick access to incoming messages and pending lab results that require your review.